Vermont's majestic mountains are well-known ski destinations in the winter, but they also serve as the backdrop for some of Vermont’s best golf resorts. To tee up in the Green Mountain state, just check out the listing of resort golf courses and events below. Jay Peak’s championship golf course welcomes two premiere events this summer with the Kingdom Invitational and the Vermont Mid-Amateur Championship. The first (and soon-to-be annual) Kingdom Invitational will run from 6/26-29 and feature two-person, 54 hole, stroke-play competition. The Mid-Amateur is open to any Vermont amateur 25 years and older. The Championship consists of an 18-hole stroke play qualifier on Thursday with the field cut to the low 32 for Match Play starting on Friday and culminating with the final match on Sunday. 8/21-24. On May 24, Killington’s golf season begins on its 6,186-yard, par 72, 18-hole Championship Golf Course and continues through October 13, 2014. The Geoffrey Cornish designed course takes full advantage of the local mountain terrain and offers a refreshing round for any golfer complete with snowmelt streams and elevation changes. Private lessons, multi-day golf schools and junior specialty experience are offered in addition to weekly public league nights and private tournaments. Hone your skills on the 12,000 square-foot putting green and practice bunker, then satisfy your hunger and thirst inside or out at the Clubhouse Grill overlooking the Green Mountains, at the on-course caddy shack or via the roving beverage cart. Mount Snow Golf Club, surrounded by the Green Mountains of southern Vermont in the resort village of West Dover, is an 18-hole championship course that combines challenge, forgiveness and aesthetics into one. Stretching nearly 7,000 yards from the championship tees, the course features wide fairways, large greens and strategically placed bunkers and water hazards. Fairways Restaurant offers a great menu of fresh food and a full bar and you can gear up in the fully stocked pro shop. MSGC is also home to vast practice facilities and The Original Golf School which offers multi day programs. This season’s projected opening date is May 10. Two championship 18-hole courses and a Family Fore course make Okemo Mountain Resort a choice destination for golfers of all ages and abilities. Okemo Valley Golf Club is Vermont’s premier heartland-style course. The par-70, 18-hole championship layout features wide, emerald fairways framed with rolling fields of golden fescue. Moderate elevation changes, strategically placed hazards and undulating greens, are the hallmarks of this scenic course. Okemo’s Family Fore Course is a four-hole family fun course offering beginners and future players all the course attributes with none of the pressures of championship course play. Available throughout the season weekend afternoons, this condensed, fun round of golf comes at an affordable hourly rate. Call (802) 228-1396. Tater Hill Golf Club, a par-71, 18-hole championship course, offers plenty of challenge for low handicaps, golfers of all ability levels can enjoy a layout that features undulating fairways, spectacular views, flower gardens and the casual ambience of an old Vermont hill-farm. 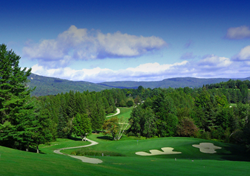 Stowe boasts two of New England’s finest golf courses, both on and off the mountain. In the heart of Stowe’s town you'll find the Stowe Country Club. With its undulating fairways and manicured greens, the public country club occupies what was a turn of the century dairy farm. This year the Stratton Mountain Golf Course celebrates its 50th anniversary! The first 9 holes opened in 1964 and the course has since grown and matured into 27-hole championship course. Let the Green Mountain terrain challenge you against the beautiful backdrop of mountains, forests and lake. The Stratton Mountain Golf School has programs for players of any level to hone their game with special sessions geared toward women, families and kids. Adult Golf School programs start at $199. Both course and school open May 17, 2014. More information and booking are available online or by calling 1-800-STRATTON. The Sugarbush Resort Golf Club is slated to open on May 2, 2014 weather depending. The par-71 Robert Trent Jones Sr. golf course is designed with respect for the natural setting and boasts breathtaking views of Sugarbush and the Mad River Valley. It also offers one-on-one instruction with PGA professionals RJ Austin and Paul Menier, catering to all skill levels as well as group clinics and custom club fitting.